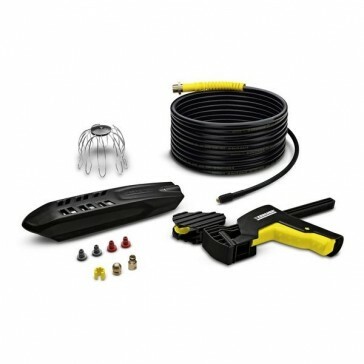 2-in-1 system ideal for quick and easy cleaning of gutters or pipes and drains without the need of a ladder. 20m high pressure hose and extra short brass jet for optimal pipe flexibility and easy cleaning without the aid of a ladder. Designed to clear blocked pipes and drains. The gutter cleaner moves independently through gutters to remove leaves, fir needles and dirt. Robust design with interchangeable nozzles and integrated bumper.